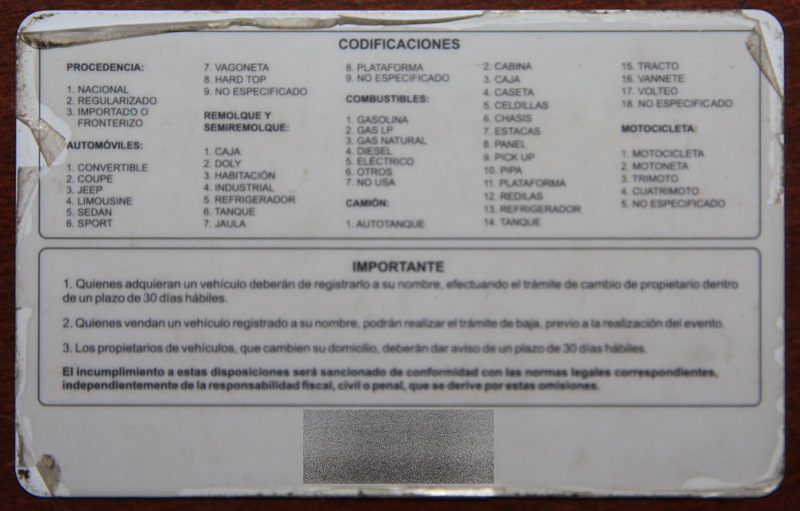 How to buy a new or second-hand motorbike in Mexico? 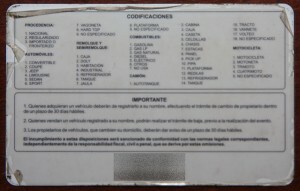 This article provides basic guidelines for buying new or used motorcycle in Mexico. I tried to make an extended search on the web and spoke with some Mexican friends who gave me lots of valuable advises. Now I am providing the information in summary here. Registration is compulsory and insurance is optional. It is true that plates are not needed in some cities. However, if you choose not to register the motorcycle, and then in the future you try to sell it, that is when you will be hit for all past registrations, plus the fines for not registering. In many areas of Mexico you see bikes without plates and those rules are sometimes not enforced, especially with small bikes and scooters. If you plan to take a bike onto the open highway, outside of cities, then plates and registration are definitely needed, as the Federal Highway Patrol has no such policy of looking the other way, like in some cities. Travelling around the country on a bigger bike you need to have the paperwork in order or you are asking for trouble everytime you get stopped. 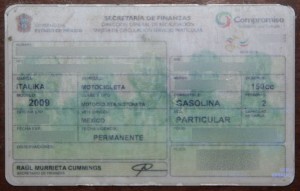 Most states of Mexico require a residency visa to get plates for a bike. 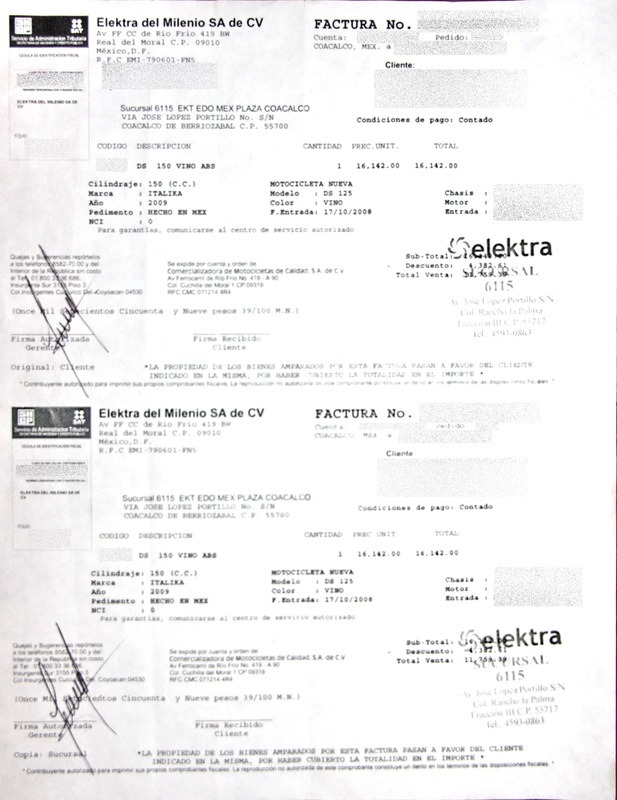 The original bill of sale (Factura), is the title in Mexico, and it is irreplaceable. Copies are invalid. An FM-3 visa may be required to register the bike, but that is a state matter, and you need to find out the laws of the state you intend to register it in, as there is the possibility that there is a state that does not require a residency visa (FM-3). 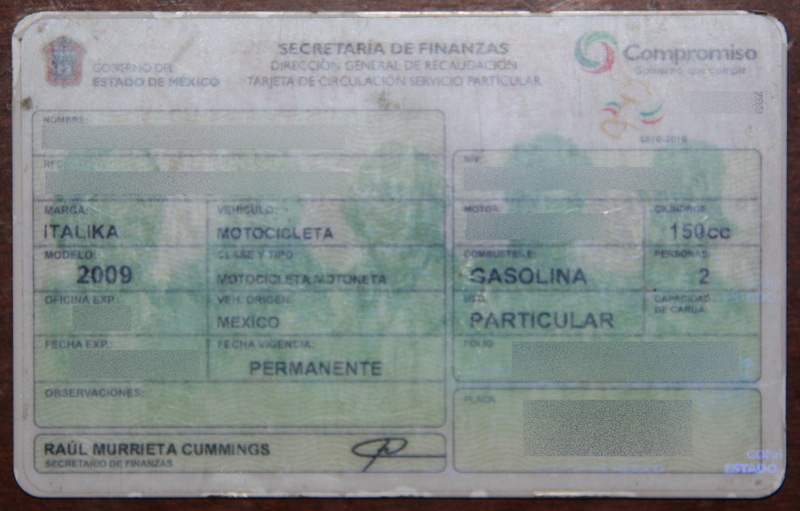 In summary it might be always easier to buy the motorbike and register it on the name of a Mexican friend who is willing to do for you this kind of favor. 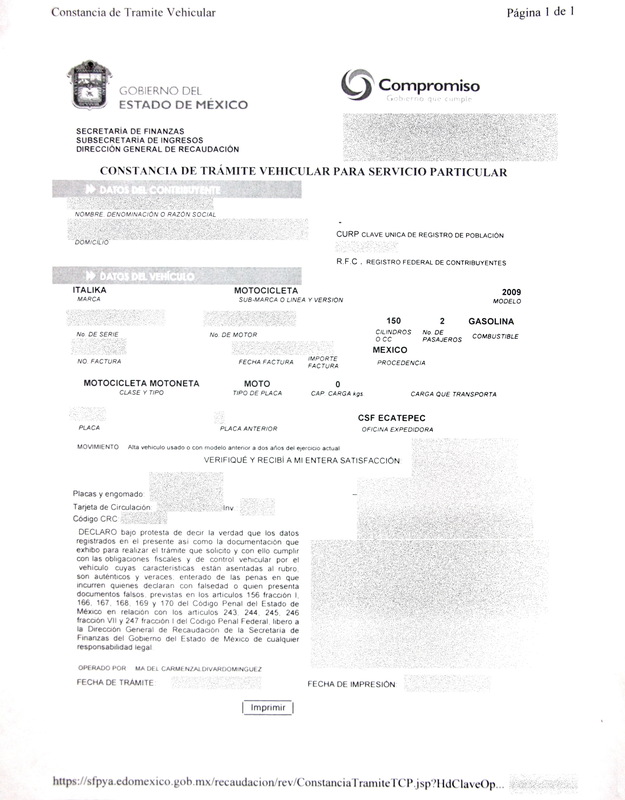 If you buy a second hand used motorbike, it’s highly possible that such bike had already been registered with the first original owner (usually Mexican). In this case it’s allowed to only write down “compra-venda” agreement that is basically selling contract between buyer and seller of the motorbike. There are some places, especially in bigger cities, that transform to some kind of flea markets for second-hand vehicles. Where ever you are, your Mexican friends will definitely be able to advice you about some local “tianguis” as these places are called in Mexican Spanish. In Ciudad de Mexico, locals come every Saturday and Sunday to Tianguis del Auto in Tlalpan, Distrito Federal, which is a huge event for sellers and buyers of second-hand vehicles. You’ll be surprised about how many cars are being sold there every weekend. 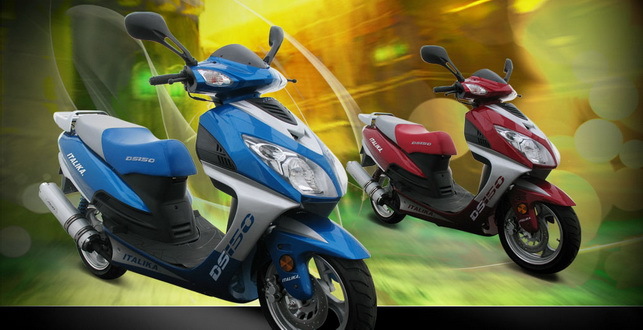 Regularly faster sport motorbikes are being sold, too, and with a little luck you’ll find scooters or “motonetas” as well. If you live in Mexico City, I really recommend checking out this place or searching for a local “tianguis” at least to get familiar with the prices. 1. 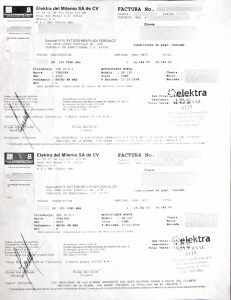 FACTURA ORIGINAL - THE ORIGINAL INVOICE THAT WAS RECEIVED FROM SELLER WHEN BUYING A VEHICLE. 3. 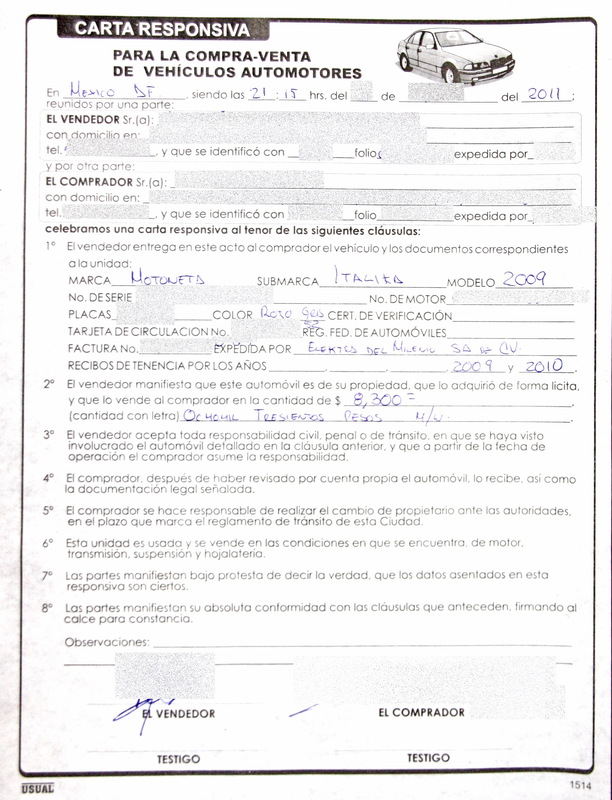 Constancia de Tramite Vehicular - a record that the vehicle has registered its tenancy. 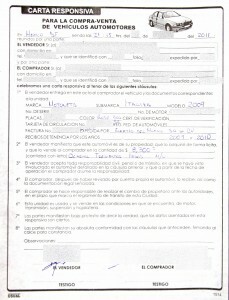 Plus confirmation that it was paid by Its tenant, that can also be verified online as mentioned above. 4. 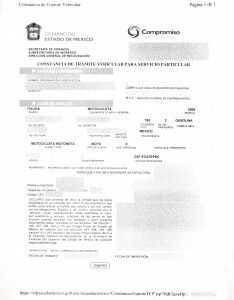 Carta Resposiva para la compra-venta de vehiculos automotorales – a mutual written agreement between buyer and seller written upon selling a vehicle and signed by both participants. The whole process of buying a motorbike will take you some time and you should be especially careful when buying a used one from some one else. You should get ready for negotiating the price that many Mexican expect but also you should be protect yourself from getting cheated on and make sure everything is really in order and you pay appropriate price.